The butterfly motif is no stranger to the world of fashion (we were obsessed with it last spring), but every time it flies into the picture we can’t help but fall in love all over again. Thanks to Resort 15 collections like Valentino and Gucci that showed butterfly prints, celebs and street style stars are embracing their inner sartorial entomologists. Scroll down to see how they work this look, and shop your favorite butterfly-print pieces along the way! The newly pregnant actress stepped out in Valentino’s Metallic Butterfly Brocade Coatdress ($6900) for an event in New York earlier this summer, looking simply stunning per usual. Layer this butterfly pendant necklace with delicate gold chains. Blake Lively Had the Perfect Fall Baby Shower—See the Pics! We’re dying to get our hands on Barrenechea’s butterfly-embellished hairclip. Tie this scarf around your neck or in your hair for a fun accessory look. Take a cue from Palermo and wear your hair in a braided up-do to complement a feminine butterfly-print piece. A splurge? Yes. A stunning splurge? Double yes. How darling is Newton in her matching Valentino Embroidered Guipure Lace Mini Dress ($6950) and butterfly backpack? Holiday parties are right around the corner! Translation: It’s time to invest in a cocktail dress! From a plunging neckline to a butterfly-encrusted maxi dress, is there any daring trend Kardashian won’t try? We’d team this sweater with leather leggings and slip-on sneakers. This street style star sported a beautiful butterfly-embellished dress during Paris Haute Couture Fashion Week and left us inspired to try the look. Style this with a blazer and wide-leg jeans for a fashion editor-inspired outfit. Balance this neon skirt with a slouchy tee and pointy-toe flats. 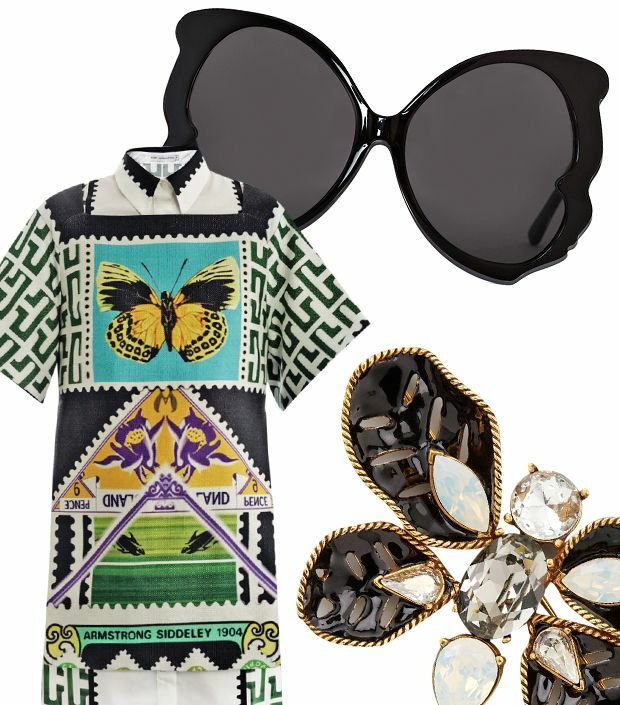 Would you try the butterfly trend? Share in the comments below!